For a long time, wireless earbuds weren't truly wireless, requiring a wired connection between the left and right earbud. 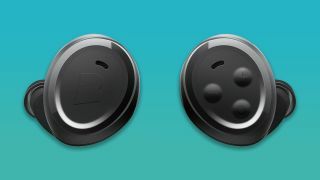 Bragi was one of the first companies to come up with a truly wireless pair of earbuds (called The Dash), but tried to do too much with their first product. Today, Bragi learned from their mistakes and released with their brand new wireless earbuds call "The Headphone." Ridiculous name aside, these are truly wireless earbuds that you'll actually want to buy. The Headphone strips away the Dash's fitness features, touch controls and onboard storage in favor of physical controls and a simplified experience. What you get with The Headphone is a pair of wireless earbuds that get six hours of battery life (up from 3 hours with The Dash), physical controls for volume and music playback and the ability make and take calls. While the Dash cost $299 (£249, about AU$440), The Headphone costs just $149 (about £112, AU$196). You can score them for even less at $119 (about £89, AU$157) during their promotional pricing, which goes until November 1. Bragi's announcement comes just days before Apple's iPhone 7 event, where Apple is expected to release the first iPhone without a headphone jack. Apple is also expected to release a line of Lightning-enabled headphones to work with the iPhone 7, and will push wireless headphones in its retail stores. Apple isn't the first company to release a phone without a headphone jack either. The Motorola Moto Z ditched the headphone jack in favor of a single USB Type-C connector. Since there aren't many USB Type-C headphones on the market, Motorola included an adapter to use traditional headphones. Unfortunately, this means you can't charge and use your headphones at the same time, a reality iPhone 7 users may have to face as well. The Moto Z requires an adapter to use wired headphones. It's not surprising phones are ditching the headphone jack. According to an NPD report, the sales of Bluetooth headphones surpassed sales of non-Bluetooth headphones for the first time in July 2016. People favor the convenience of going wireless, and phone makers can make their devices thinner without a headphone jack. Still, wired headphones can sound better than Bluetooth headphones as the current Bluetooth technology limits sound reproduction at CD-quality, whereas Lightning and wired headphones can support High-Res audio.